One of the most popular American holidays is Thanksgiving. Its origin as a national holiday goes back to the early days of the United States when President George Washington declared that November 26, 1789 would be a day devoted to giving thanks. In 1863, Abraham Lincoln made it a federal holiday. The first American Thanksgiving celebrated in Korea seems to have been in 1884 at the home of Dr. Horace N. Allen in Seoul. It was a small and humble affair attended by Allen, his wife and their infant son and their guest, James F. Mitchell, an Englishman who was in Seoul seeking timber concessions on Ulleung Island. They sang "My Country, ‘Tis of Thee" (which served as the American national anthem before the present one) and ate Boston baked beans. In the years that followed, the annual Thanksgiving celebrations generally took place at the American legation and were grander and far better attended than the first. On November 30, 1893, a great Thanksgiving feast was held at the legation hosted by Allen, now serving as the Charge d'Affaires. According to one participant ― Elizabeth Greathouse ― games were played and "Yankee Doodle was sung with a vim, all joining in, as [Allen] had provided sheets of the song given to each person. Then some old songs that carried one back to younger days ― then at near 11 o'clock we were invited in the supper room; literally loaded down the table was, with substantials, as well as delicious sweets, cakes, candies, etc., coffee and lemonade. No wines and none would have been touched perhaps; nearly all the guests were missionary teachers and their families." The festive mood was not dampened by the sudden appearance of hail ― apparently some guests even used it to cool their drinks. It is not clear what the "substantials" were, but ham and beef were undoubtedly on the menu as well as large fowl such as geese, swans and maybe even a turkey. But turkeys did not thrive in Korea so some were occasionally brought in alive from China and butchered just before the holidays. Sometimes political events dampened the spirits, such as the case in 1896. In mid-November, Sally (wife of the American Minister to Korea John M. B. Sill) and her sister began preparing for the Thanksgiving dinner to be held at the legation. Unlike previous years when most of the Western community was invited, Sally noted in a letter home, "We confirm ourselves strictly to Americans this year for several reasons." What these reasons were remains unclear but hint at the tensions in the capital. Just the previous month the Korean queen ― whom Sally felt very close to ― was brutally murdered and King Gojong was made a virtual prisoner of the pro-Japanese government at Gyeongbok Palace. In November, the capital was rife with rumors ― some claimed that the queen was still alive while others whispered of plots to free the king. "For once the rumors amounted to something. We all passed a most restless and uncomfortable night. I was really ill and coughed almost constantly until morning, but that was of the least consequence ― there was another raid made upon the palace and as we could hear the firing and shouting of the mob here, it was very exciting ― the poor refugees were terrible frightened and your Father was dressed all night. The Palace was not entered and by daylight everything was quieted down, but it was a sad Thanksgiving morning. About seven o'clock I was taken with a chill which lasted for more than two hours. The Dr. came and said that all the invitations for the evening (all the Americans were to be entertained here, and every preparation was made) must be recalled. I felt dreadfully to make so much trouble but was allowed no voice in the matter." Was it truly Sally's poor health that canceled the celebration or was it the stress caused by political instability? The attempted rescue of the king had failed due to betrayal and poor planning. 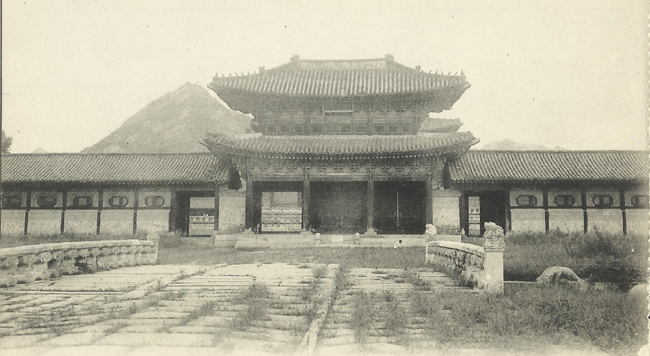 Over the next couple of days, so many people were arrested that the prison in Seoul was described as being "full and the mint ― the ‘monument of folly', as it was once nominated ― has been improvised for the purpose of storing those delinquent in patriotism." Japanese and Korean newspapers such as the Ganjo Shinbo (Seoul News), suspecting American involvement in the rescue attempt, denounced the Americans ― especially the Christians ― for meddling in local affairs. The newspapers suggested that the missionaries had forgotten their calling and would be hard-pressed to justify their actions to their god. There were also threats that the foreign community would be attacked. It was feared that the Americans in Seoul would all have to be moved to the American legation for their safety ― guarded by American marines from the warship U.S.S. Machias. There was no Thanksgiving in Seoul in 1896; there was little to be thankful for ― all anyone could do was to await the promise of a new year. The future would have more tragedies in store for Korea, but the Thanksgiving tradition has carried on as well.